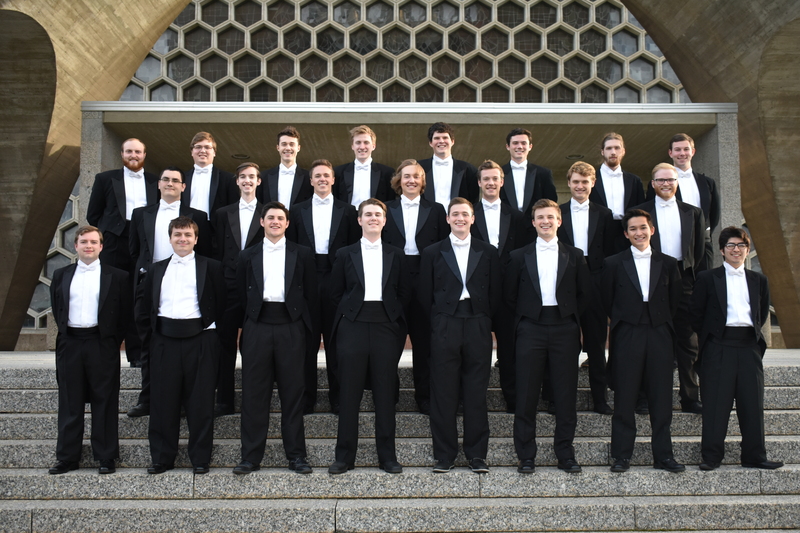 This concert is part of the choir’s 2018 – 2019 Concert Season. Under the direction of Dr. Axel Theimer, a native of Austria and a former member of the Vienna Boy’s Choir, who has been on the music faculty at Saint John’s University and the College of Saint Benedict since 1969, the 26 member choir is performing concerts throughout Minnesota and Wisconsin and, during the day, visiting high schools, sharing their music with music lovers of all ages. Traditionally the program features a wide variety of sacred and secular music, ranging from polyphony of the Renaissance to masterworks of the 21st Century. This year’s performance will, amongst others, include compositions by Rosephyn Powell (Sorida), Mitchell Sandler (Byker Hill), Ethan Sperry (O Saya), Anton Bruckner (Ave Maria), Naomi Shemer (Yerushaleyim Shel Zahar), Hans Leo Hassler (Cantate Domino), Carl Maria von Weber (Jägerchor), Eric William Barnum (I come singing), Stacey Gibbs (arrangement of Sit down Servant) and the always popular O MIster Moon, The Johnnie Fight Song and (!!!) possibly even some Barbershop and Back to the ’50 favorites.